Another recent jazz album. This one is super fun. Out on Blue Note last year, just a nice combination of jazz, funk and weird computerized electro-acoustic sounding mumbo jumbo. Lots of different sounds, but definitely a fun and rewarding listen. And just look at that album cover. To play jazz, one has to be a complete musician. Requirements: technique, imagination, huge ears, improvisational spark, superb time, and empathy. Jazz is not rife with fakers. As a result, many greats get lost in the fray of musical excellence. Maybe one has been Kenny Werner—and maybe we’ve found him now. Boy, have we. Aficionados have known him forever. Since the early 1980s, Werner has been playing in fantastic trios, working with the likes of Archie Shepp and Joe Lovano, and becoming a fixture on New York’s jazz scene. I’ve heard him as an intelligent and somewhat indirect player—a guy with a voluminous jazz vocabulary of chords and lines who has neither the blues snap of Wynton Kelly nor the languid lyricism of Bill Evans. But what did I really know? Werner was also a brilliant and deeply rhythmic solo player (check out his set Live at the Maybeck Recital Hall from 1994). Maybe I’d only ever heard a part of his art. Lawn Chair Society—his first Blue Note record, and his second stint on a major label after a pair of RCAs in the late ‘90s—sets Werner in a new and stunning light. Known as a modern acoustic pianist, Werner does much more than just fool around on a Fender Rhodes on Lawn Chair. Rather, this is an integrated electric/acoustic album that manages not to bury the personalities of its soloists—a rare accomplishment. The soloists are formidable. In addition to Werner—who improvises only on the acoustic, and with lyricism and wit—the recording features Dave Douglas’s trumpet, Chris Potter on tenor sax and bass clarinet, Scott Colley on bass and Brian Blade’s drumming. Blade brings a unique sound to the disc, never swinging in the straight ahead jazz sense but playing every manner of atmospheric funk pattern, loud and soft, in and out. All the players act similarly as colorists as well as melodists, with Douglas using various mutes and Potter adopting different tones to blend with the electronic environments conceived by producer Lenny Picket for Werner’s compositions. As the players color the pieces, they manage to retain their own voices—Dave Douglas is till piquant and puckish on cornet, Potter jumps and mutters like he is always making a joke, and Colley plays with unparalleled beauty. Most of the compositions are improved by a well-planned use of electronics. Right out of the gate, “Lo’s Garden” processes percussion through a sequencer of some kind. But rather than being a tune with merely a cheesy fusion-electronica bed, Douglas and Potter (on bass clarinet) play a herky-jerky line that meshes in rhythm and sonority with the groove. Werner’s keyboards are not up front—he always saves the soloing for piano—but they generate pulsations and feeling below the surface. With Colley’s sound always earthy and round, the result is balanced: no fusion flash or smooth goopiness, just a single-minded approach to a fascinating tune. “Lawn Chairs (and Other Foreign Policy)” integrates acoustic and electric differently but just as well. Though it begins with a hip acoustic piano rip, it then moves into a ragtime-ish keyboard groove that Douglas plays over as if he were some kind of doped-up Louis Armstrong—growling, smearing, and diving for fun with a touch of Miles-ian echo. The two horns then play a line that becomes the ground rhythm as percussion and bass enter. This gradually morphs into a piano solo with traditional acoustic accompaniment, winding up eventually in a Rhodes-and-organ-saturated groove that directly references In a Silent Way. It’s marvelous, however, because each of these transitions is achieved with slight-of-hand. The tune feels complete. The highlight for me is the astonishingly direct and emotional song, “Uncovered Heart”, written 16 years ago at the birth of Werner’s daughter. The synthesized content is limited to subtle string pads, with Werner playing a Jarrett-like open style that emphasizes rhapsodic melody. After Werner states the simple tune in two choruses, the horns play a variation as introduction to a smashingly plain and lovely bass solo. When Werner solos it is equally elegant and elegiac. It makes sense that “Uncovered Heart” should be the album’s showcase, as Werner’s daughter, Katheryn, was present for the recording but died in a car accident before the album’s completion. “Loss”, a short, synthesized orchestral piece that likely refers to Werner’s terrible loss, leads the album back to a bass line similar to that of “Uncovered Heart”, which then leads into the album’s only cover, “Kothbiro”. Another highlight, this tune moves with inevitable and stately grace. Werner’s solo is stripped of all clichés, and the trading of statements by Douglas and Potter is the kind of plainsong that jazz always needs more of. Werner—knowingly or not—has created a substantial monument to his love for his daughter. If I have failed to write about the adventure of Chris Potter in mid-thought or the flash of Brian Blade when he is fused with the piano vamp on “Inaugural Balls”, it is only because Lawn Chair Society is such a thoroughly integrated recording that it tempts the listener to forget its flashiest moments. “Balls” bustles into a brilliant collective improvisation fueled by organ swells and pure Blade hipness. “New Amsterdam” gets started with a Herbie Hancock-ish gospel groove that is jagged and funky at once, with Colley latching it all to the dirt. These tracks are propulsive and meaty just as “Uncovered Heart” and “Kothbiro” are infused with legitimate sentiment. The balance in it all—electronic whooshes meshing elegantly with skin on ivory—is the record’s ace in the hole. The closer you listen, the higher Kenny Werner’s Lawn Chair Society will rise on your year’s-best list. Firm and delicate, electric and acoustic, gentle and daring, it does with nonchalant ease what 30 years of “fusion” has done so rarely: keep jazz both serious and modern as it integrates the possibilities of new technology. Suddenly, Kenny Werner (along with producer Lenny Picket) is a jazz master and maverick—a veteran artist whose voice has come alive on a big stage. 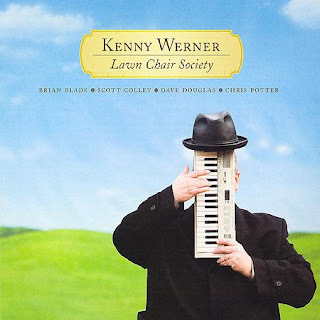 Pull up a lawn chair and check out Kenny Werner. His time has come.